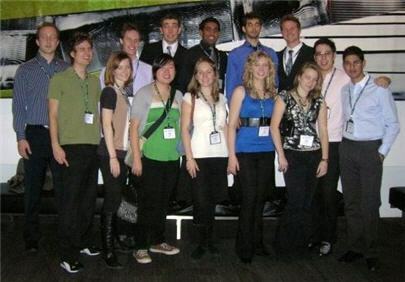 The Canadian Society for Chemical Engineering (CSChE) is the national body for chemical engineers. It helps chemical engineers to stay in touch with each other, keep up-to-date on technologies, etc. This is particularly important after you graduate; suddenly you are no longer surrounded by your friends of four years (all scattered across the globe in various industries), and it is rare to be working with more than a couple other chemical engineers in the same company. BUT, we aren't there yet. For us, the focal event of the CSChE is the national conference, which is held in a different city every year. This is a great chance for us to meet industrial people, researchers and entrepreneurs, and find out what is happening in our field across the country. CSChE national conferences are big events. In 2008, it will be in Ottawa, QC: check it out! In August 2009, McGill will co-host the 8th World Congress of Chemical Engineering in Montreal with École Polytechnique. All students interested in participating as a volunteer, please visit here. Volunteers must be available on Saturday August 22 PM for training. To get free registration, undergraduates must work during 3 days, and graduates during 2 days. ChemEng students are a very tightly knit group. That is a big change from the nameless faces of those who enter the science preparatory year (called U0). You get to know everyone around you! When you start out, there are about 115 students in your class; in total, we number approximately 300 undergraduates. Yes, we do work hard in our curriculum – but we play, too. There is a list of activities and events that the council organizes below. Let's just say we like to keep ourselves busy between assignments. You can usually find us either frantically finishing an assignment in the cafeteria, working hard (e-mailing) on the computers in the design room, or just hanging out in our common room, all on the main floor of the Wong Building. Come visit us, and see what we're up to!